As the weather continues to heat up, I find that I still need a lightweight cardigan to wear in the office or outside in the evening. Our cotton boucle megaskeins are the perfect yarn, and with 475-500grams per skein, one is all you need for that summer knitting project! Remember that slubby texture means that the yarn knits up with a lovely drape on a 4mm needle, so although it’s classed as a 4ply, try searching for DK-weight patterns – and remember to swatch! A quick browse through the pattern library on Ravelry gives some great ideas with free patterns, such as this Cinnamon Toast three-quarter sleeve cardigan. Being an easy-knit stocking stitch design worked classically in separate pieces from the bottom up, this should be a quick win. 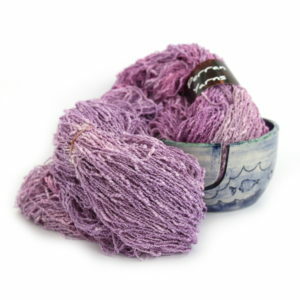 It’s sure to look great with the boucle texture of our handdyed cotton yarns. If you prefer something a little more challenging, try the Lisette sweater. It features beautiful scrolling lacework around the neckline fading down into the body, which will add interest to your knitting. There are several colourways of the cotton boucle yarn in our Etsy shop, but if you don’t see your favourite colour, just contact me to custom dye it for you! ← To swatch or not?